You have volunteered or been drafted to help on the banquet committee, now you will need to come up with some refreshing ideas for this year's event. 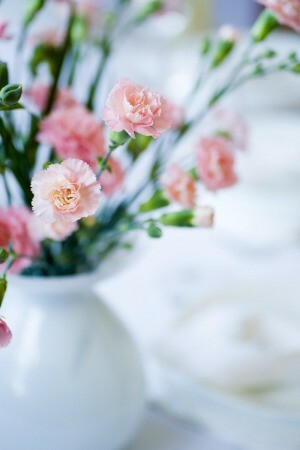 This is a guide about spring banquet ideas. I have to decorate for some Spring Banquets - the theme is 'Bloom Where You Are Planted'. Any ideas? I need about 30, so they have to be fairly inexpensive. I'd look for some primroses. You might be able to get a whole flat at Costco, Sam's Club or a local nursery or greenhouse for less than the normal 79-99 cent price. There are several colors and you could work your centerpieces around them. If you can get a loan of some crystal bowls or plates (or the plastic crystal look alikes) you could put your primroses on the "crystal". You don't say how long you have to plan but small watering cans might be another good centerpiece. You could put fresh flowers in the watering cans. I'd think there would be some available, either tin or plastic in the Easter stuff. Green crepe paper should be going on sale at the dollar stores right after St. Patrick's day. You could decorate with some of that around your centerpiece on the tables or streaming around the edges of the room. Hopefully there are some here with more ideas. You can find little garden gloves, small gardening spades, iron butterflies, and dragonflies sometimes at Big Lots as well as small watering cans. Alternating tables, it turns out to be a cute idea, placing these items on the tables. They also have previously carried little wheel barrows that could add to the effect. If the banquet is elegant then a dish of floating candle flowers would be good with green fish bowl rocks (penne pieces). They are clear and kinda flat usually in beta bowls. if you require more daytime center pieces, you could get green confetti and spread around the center of the table, place a foam circle spray painted green, place grass greenery on it (even moss), place stick flower stems. Place frogs or bees, anything that goes in the plants you get at florists or garden areas. Then place a hanger shaped in a u to form an arch wrap with ivy or other vine plant to create a high point. Place a wide ribbon from one side to the other with the org. name on it. Float the head (no stem) of a single gerbera daisy in a small globe-shaped vase half-filled with water. It sounds plain, but it's really fresh, minimalist and striking. Like a little water lily. If it is more formal where you need name tags at each seat you can buy those miniature clay pots and a few bunches of silk flowers and paint with a paint pen each persons name onto the clay pot. You can also spray paint the pots in varrying spring colors then paint the names on the pots. Use modeling clay or foam pieces in the bottoms of the pots and add one or two silk flowers you have cut off from a bunch. You could also get by with green tissue paper poking out of each pot in place of the clay or foam and add one single flower to the center of the tissue. Make one medium sized matching clay pot for the center piece. Or fill each centerpiece with a pair of garden gloves, a few flower or vegetable seed packets, hand sized garden tools, etc. and as door prizes you can do drawings for each centerpiece. There are also edible flowers that you can freeze into ice cubes. These are festive and pretty and can be used in water glasses or lemonade glasses. Help! I need some ideas on how to decorate a High School cafeteria for a spring sport banquet. The kids that will attend are golfers, baseball and softball players, tennis and track. We don't want the room to like the cafeteria, but don't want to spend a fortune either. Any ideas? Balloon bouquets are always festive, have a big presence (i.e., they take up a lot of room visually), and don't have to cost too much. There are cute Mylar balloons that look like various sports items (soccer/tennis/base-/foot-balls, bats, etc.). Mylar balloons are much more expensive than the regular latex balloons, so I often purchase just one or two Mylars to match my theme, and group them with a bunch of latex ones as "filler" (maybe in your school's colors?). If you could get your hands on some of the green deck carpeting to make it look like a golf green you could use that in some way. Maybe even set up a mini-putt course around the room or just a practice putt green in a corner of the room. Get various balls and set in the center of the tables as centerpieces. You can use a football stand for the footballs and you can find any kind of ring (diving rings from swimming pool kits, embroidery rings, etc.) to set the round balls in the center of the tables to hold them onto the table. Place balloon bouquets along with them. Use sport jersies over the backs of the chairs. Or if you are using the cafeteries tables, you can set several chairs up by the podium or if there is a check-in table you can slip them over those chairs. Make pretend "retired" jersies in frames out of posterboard. Use funny names like the coaches name or the principal or a teacher that is not likely to be sport-worthy. Or honor a known athlete (past or present) with their name on the jersies. Hang these around the room or hang three on each wall or something. You could also hang any championships banners your school may have around on the walls. Most party stores have plastic serving bowls and trays in the design of sport balls or you could design your own by buying trays in the colors of the ball you are desiging and paint or use marker to draw the desing on each one. Depending on how formal this is, instead of drinking glasses, you could give each person a sports bottle to drink from. You could also set up a mock Gatorade bench as seen on football fields and they can refill their own drinks or just have empty Gatorade jugs for decoration. Depending on how much room you have, you could use portable soccer nets just pushed up against the wall, or set in a corner of the room with soccer balls around it. Set a golf ball on each plate with their name on it if you are having arranged seating. If you set the napking on the plate and the ball on top of the napkin it won't roll aruond. Also...Most schools have rolls of colored paper for school projects or for pin-up boards in the halls. You could use the green paper and get several pieces and tape together and cut into a warbled shape like a putting practice mat. If your cafeteria floor is not already marked for a basketball court, you could use colored tape to make it look that way or even to look like a football field with the numbers marked on the sidelines.